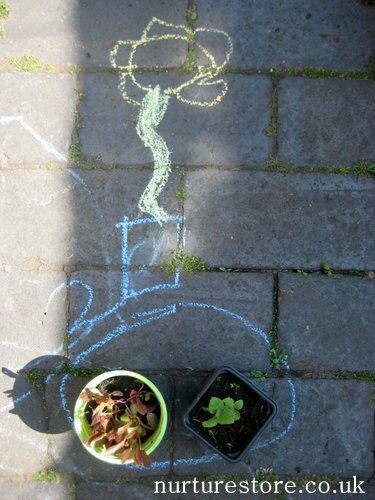 We’re having so much fun exploring all the kids gardening activities we can come up with using chalk this week. 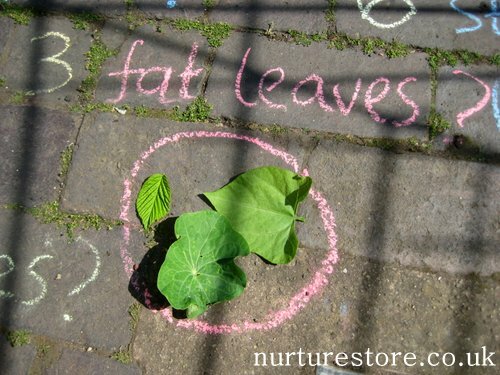 Taking One Added Ingredient and introducing it to lots of different areas of play gets children thinking and imagining and creating. 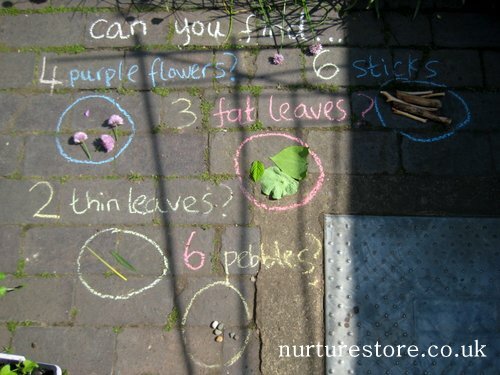 Using a material they are familiar with ~ in our case chalk ~ but adding it in different ways leads to all sorts of new play possibilities. 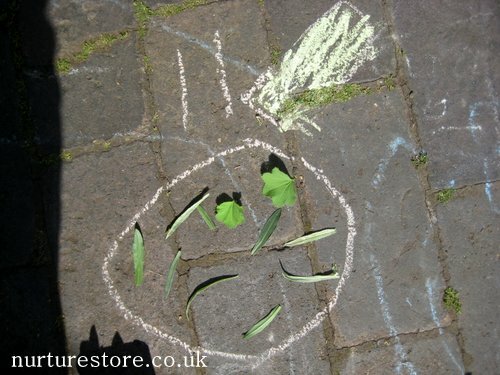 On Monday I showed you how we’d use chalkboard paint to make some ever changing puppets, in our fairy garden and in a road map right across the patio. 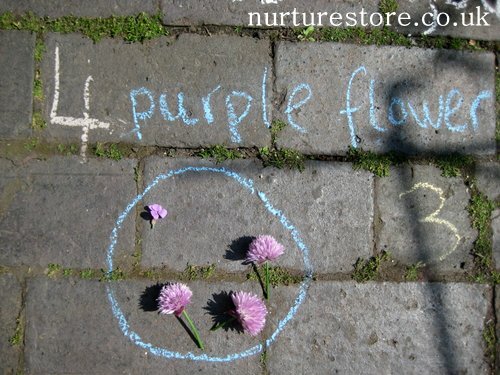 Today we’re using chalk in a treasure hunt that mixes in lots of language, maths and nature play too. 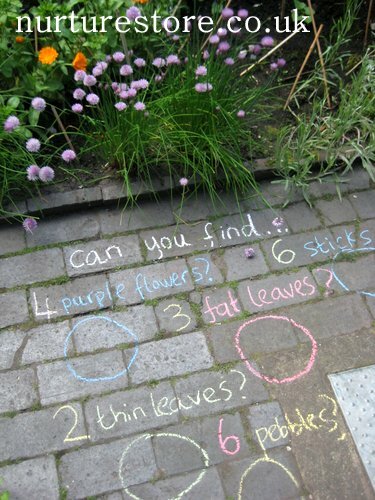 I’d prepared some treasure hunt prompts ready for when L came out to play, with a few questions of things to hunt for and chalk circles to gather the finds in. L was delighted that she could read the clues herself and set off on her hunt. We included some colours and number practice ~ recognising the written number and then counting out the corresponding number of objects. and added in a contrasting shape so we could compare. And we ended up with a great visual representation of our completed task. 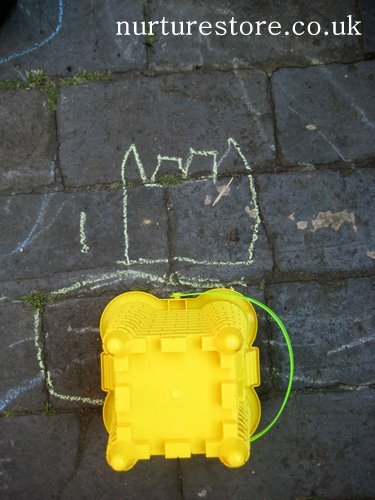 Leaving the pot of chalks out, with an invitation to L to set me some challenges, meant she got to do some thinking and writing too. And even though she didn’t feel like writing today, drawings worked just as well. This let us keep enjoying the fun of the hunt instead of it becoming a chore of having to write. 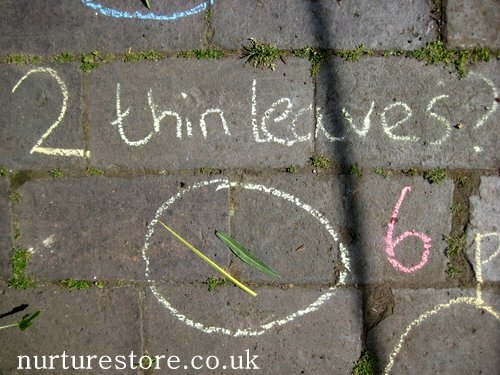 We still had lots of language play going on and plenty of counting ~ especially when Mummy placed the wrong number of items in a circle and L had to double check. And we got see what L’s favourite things in the garden are right now too. Love, love, love this, Cathy! I love this idea! So creative! Will def be doing this, this summer. Good Morning! I featured your activity today on my blog post- hope this is okay- with a link and small pic. The post is listed below. Enjoy your day!! If you would like to display a featured button on your site, you can grab one from the right side bar of your post above. Thanks for a wonderful idea! Thanks for the feature Cindy. 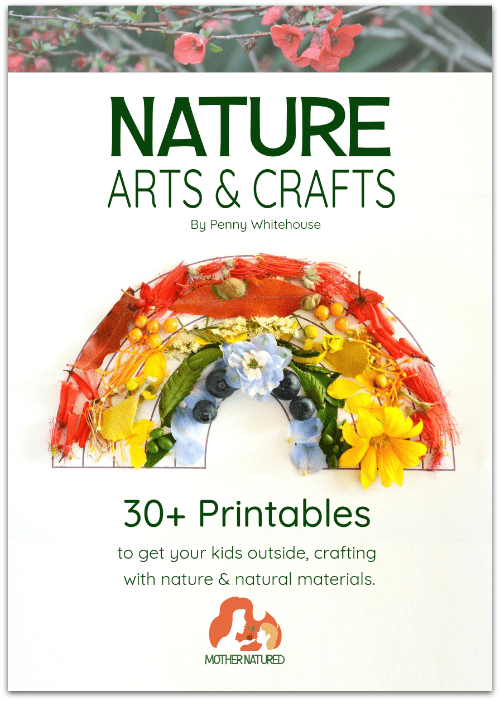 Lovely ideas for my cute grandson who is 2 years and nine months old, he loves outdoor play!